This is one of the most powerful descriptions of the scourge of the First World War by a woman who was on the front lines and ultimately gave her life for the cause. Sarah Broom Macnaughtan volunteered with the Red Cross Society when World War One broke out, and that is when she started keeping a record of what she saw. In September 1914 she travelled to Antwerp in Belgium as part of an ambulance unit, and as Head of the Orderlies she was witness to hundreds of wounded and dying men passing through her hospital. Her and her staff desperately tried to help them as best they could despite limited resources, and bombs falling all around them. For her bravery and work under fire in Belgium, she eventually received the Order of Leopold. Sarah Macnaughtan's A Woman's Diary of the War caught my eye the moment I stumbled over it. 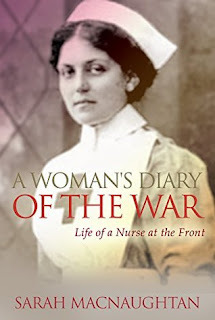 I've been looking for a surgeon's memoir from either world war for ages, but a nurse's memoir was an equally welcome discovery. Macnaughtan's observations are poignantly honest and unguarded. Her perceptions regarding the war in Belgium are not shaped by political affiliation or historic interpretation. They are personal, the kind of simple contemporary insights that are priceless to those interested in understanding the conflict through the eyes of those who witnessed it firsthand. I wish there had been more biographic information included in the book, but the writing is solid and the material itself makes the title more than a little worthwhile. A Woman's Diary of the War is a short piece, only ninety-three pages in length, but it makes an interesting companion to Sapper Dorothy: The Only English Woman Soldier in the Royal Engineers 51st Division, 79th Tunnelling Co. During the First World War and stands as a brilliant example of British understanding and rectification of the conflict. We were breathless, not with fear, but with astonishment.